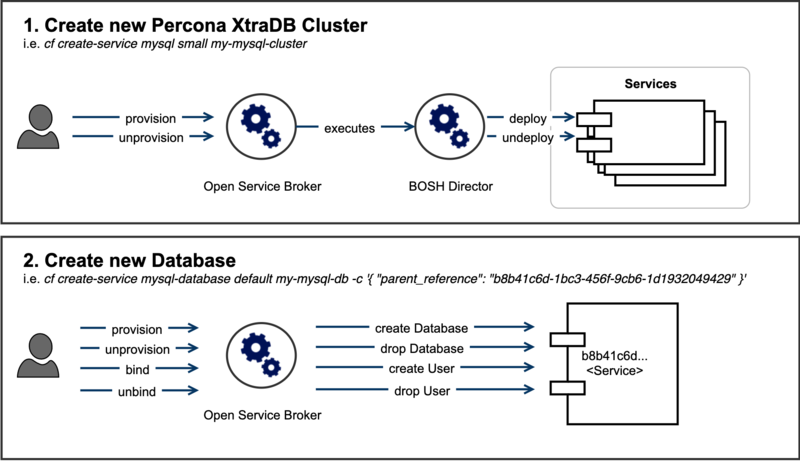 Percona XtraDB Cluster is a high availability and high scalability open source solution for MySQL clustering. It integrates Percona Server – an enhanced drop-in replacement for MySQL – and Percona XtraBackup with the Codership Galera library of MySQL high availability solutions. How is it different from standard MySQL? Percona’s releases are based upon recent versions of the MySQL server source code. It is fully compatible with standard MySQL. How is it related to other MySQL forks? Percona Server with XtraDB is the closest to the official MySQL Enterprise releases from Oracle. It is more conservative than MariaDB, which includes extra storage engines and more far-reaching code changes. At the moment we deploy MySQL 5.7.x. As soon as MySQL 8.0 is available we will inform you via our newsletter. First provision the cluster based on different plans. Second provision n databases/schemas on top of the cluster and use it for binding. To create a dedicated cluster, the following command is used: cf create-service mysql small my-mysql-cluster. Please choose a plan according to your needs. This may take up to 20 minutes, because dedicated VMs are being deployed in the background. After successfully completing the command, a dedicated cluster is created. However, no database (CREATE DATABASE) and no credentials (CREATE USER / GRANT) have been created, yet. The service instance doesn't support binding. Therefore, we need to create databases CREATE DATABASE via the service broker. First, get the GUID of your service and keep it secret. The GUID is used to provision separate MySQL databases in this specific cluster. You can create databases in any ORG and SPACE. Bind the database my-mysql-db to your application with cf bind-service myapp my-mysql-db. Please be aware that the number of concurrent connections (max_connections) to MySQL is limited and depends on your plan. You must manage this by using connection pooling. The service mysql-database has two plan types default and mtls. Using the mtls plan will activate tls-security for the created binding. Please, follow the instructions of how to use SSL enabled connection for your local development tools. First create a service key. Next create a SSH tunnel with cf ssh <your-app> -L 3306:<db-host>.service.consul:3306. The <db-host> is a UUID (for example 9bd40015-6daa-4fe9-a38e-575f8ad17bb9) URI for your deployment. Create a .my.cnf in your home directory. If you work with graphical MySQL Workbench click on “MysQL Connections” -> SSL -> Use SSL: Require and Verify CA and then fill in the paths to your certs. Do not use the SSL Wizard. Our MySQL offering is based on Percona XtraDB Cluster with Galera Replication, which brings some limitations with it. Vendor summary Percona XtraDB Cluster Limitations. Please read through these points carefully. InnoDB storage engine only. All other storage engines are disabled. Please use indexes according to your query pattern. Every table must have a Primary Key! Check for errors, even after COMMIT. Avoid the use of explicitly locking LOCK TABLES as it is local and replication transaction can’t forcefully abort it. LOAD DATA INFILE is disabled. See Security Issues with LOAD DATA LOCAL for more details. ALTERs are handled differently. See SCHEMA UPGRADES for more details. Please be careful and test schema migrations. CTAS CREATE TABLE AS SELECT is not allowed. See Why You Should Avoid Using “CREATE TABLE AS SELECT” Statement. TRIGGERs and EVENTs may need checking. By default, with row-based replication, triggers run on the master, and the effects of their executions are replicated to the slaves. We deploy your cluster with pxc_strict_mode=MASTER, so please make sure you read the guide about PXC Strict Mode add-on docs. Long running DDL changes (for example ALTER TABLE with thousends of records) may cause an outage for your cluster. In accordance with the service plan you choose from the marketplace, resource limitations are enforced. Please note that exhausting those limitations comes with certain risks, and MySQL itself has very limited means of preventing overload / overuse. See Migrate from MariaDBEnt to MySQL how to migrate your service instance to this service. If you need support, please ask a question on Stack Overflow #swisscomdev. With the joint support of the community, our experts and MySQL users, we are able to provide you with faster and better answers and cover a broader range of expertise. If you get the impression that your database server might be down, please contact us. Application Cloud Documentation © 2019 Swisscom. All Rights Reserved.